That was a proper Six Nations tussle - excitement, end-to-end action and bruising collisions - that hung in the balance right until the final few minutes. In the end, Wales' streetsmarts and immense defence got them over the line against a depleted but valiant Scotland. That keeps their Grand Slam bid well on track and only Ireland can stop a clean sweep in Cardiff next weekend. For Scotland and Townsend, yet more frustration. Three losses on the bounce for the first time in his tenure and they now must win at Twickenham for the first time in over 35 years to add to their measly haul of one victory. There's plenty more rugby across the BBC this weekend with England hosting Italy in 10 minutes' time and Ireland's trip to Paris tomorrow. Join us again for those, and enjoy the rest of your weekend. Scotland head coach Gregor Townsend on BBC One: "There is partly frustration but a lot of pride, we gave a true picture of what we are capable of. "The players had to handle some things that went against them, injuries early on and reshuffling the backline and players out of position, but we showed what we were made of in that second half in terms of the rugby we want to play and in our character. "We had enough pressure in the second half to win. Strong defences will force errors but but we forced a lot of penalties out of Wales, I think five in the 22 that should normally lead to yellow cards with that pressure, but obviously we are very frustrated that that didn’t happen." Quote Message: Wales are in a good place and winning is a habit. if they win next week it's the best they could have done. Wales are in a good place and winning is a habit. if they win next week it's the best they could have done. It was a comfortable first half and then you don't get out of you own half in the second. Scotland played well and their bench was good, so you have to give them credit. When you look back on a Grand Slam there is always one game you think was close and that was probably today. We have got a dream at the moment and we will start planning for next week. We made a few errors and our line speed wasn't good in areas but it got better. It has been a tough week for the boys mentally but they dug deep and showed some character. This group have forgotten how to lose and hopefully that continues next week. Quote Message: That performance in the second half was much better than in Paris. At least today they got their game back to an extent, got scoring opportunities and then scored a great try. I am more encouraged by that second half. That performance in the second half was much better than in Paris. At least today they got their game back to an extent, got scoring opportunities and then scored a great try. I am more encouraged by that second half. Scotland back-row Josh Strauss on BBC Radio Scotland: "It's tough being the team that puts the effort in every game and gets close and then can't pull it off, that's more frustrating. "We'd probably rather lose by 20 points. It was a good effort but we need to have a better performance. "We've got a lot of injuries at the moment and a few new boys coming in. The belief is there but we're not getting it done and that's soul-searching. "We've got to look at ourselves, look inside the group and see what we can do better. We've been doing that over the past three or four weeks but just not been able to pull it off and that's the frustrating thing. But that's international rugby, we've just got to be better and try pull it off the next game." I don't know who was talking about Grand Slams but Scotland did a job on us in 2017 and they almost did it again in the second half. We started well but we definitely didn't win that second period. We couldn't get the ball back and gave them easy penalties and we just didn't get out. Shaun Edwards (defence coach) earned his wage this week in the way we defended. We feel like we are improving game by game but it was more of a defensive performance today. We will make sure we enjoy each other's company tonight and then we start again when we go back to Cardiff. Scotland captain Stuart McInally on BBC One: "We're obviously massively disappointed with that. We had a chance to win the game and weren't quite accurate enough. "We have high expectations of ourselves and we hate losing at home. We use all these experiences to learn and get better." Quote Message: Scotland have to take the opportunities they are creating. It was decent Welsh defence, but it was breakable. Scotland had the opportunities, but they didn't take them. Scotland have to take the opportunities they are creating. It was decent Welsh defence, but it was breakable. Scotland had the opportunities, but they didn't take them. We played pretty well in the first half but Scotland threw it at us in the second and they played well. The spectators probably enjoyed it and that is the main thing. At one stage they had three fly-halves out there so we knew they would chuck the ball around, but it was a real team performance today and we had to dig deep. It is an awesome feeling in the team at the moment and it's really exciting. It's an amazing time for all of us in our careers and we will enjoy it. Quote Message: Wales hung on in there, some good replacements at good times and really good defensive effort at times because we were on the ropes there. Wales hung on in there, some good replacements at good times and really good defensive effort at times because we were on the ropes there. Quote Message: Scotland were more accurate in the second half, they created chances but, as it's been this season, we can't score at vital times. We had enough pressure, territory and possession in that second half to have scored a lot more than five points. Scotland were more accurate in the second half, they created chances but, as it's been this season, we can't score at vital times. We had enough pressure, territory and possession in that second half to have scored a lot more than five points. Quote Message: Wales did so well defensively without the ball. They have been battle-hardened over the last 12 games and it was the confidence in their defence which got them over the ball. Scotland couldn't break them down. Wales did so well defensively without the ball. They have been battle-hardened over the last 12 games and it was the confidence in their defence which got them over the ball. Scotland couldn't break them down. Joy for Wales, despair for Scotland. Another near miss. Another anticlimax. Another defeat. Darcy Graham's terrific try hauled them back within a score in the second half but despite a glut of ball in the Welsh 22, they had neither the guile nor the power to break the wall of defenders. With just one win to their name this championship, Gregor Townsend and his team travel to Twickenham next week - they haven't won there since 1983. Quote Message: It was an outstanding first-half performance by Wales although Scotland responded well after the break. It's onwards and upwards for Wales and they didn't bend. It was an outstanding first-half performance by Wales although Scotland responded well after the break. It's onwards and upwards for Wales and they didn't bend. Quote Message: It's that belief that no matter how much possession they don't have, Wales still manage to stay in there. But Warren Gatland is not going to be happy with the opportunities they gave Scotland in the second half. It's that belief that no matter how much possession they don't have, Wales still manage to stay in there. But Warren Gatland is not going to be happy with the opportunities they gave Scotland in the second half. 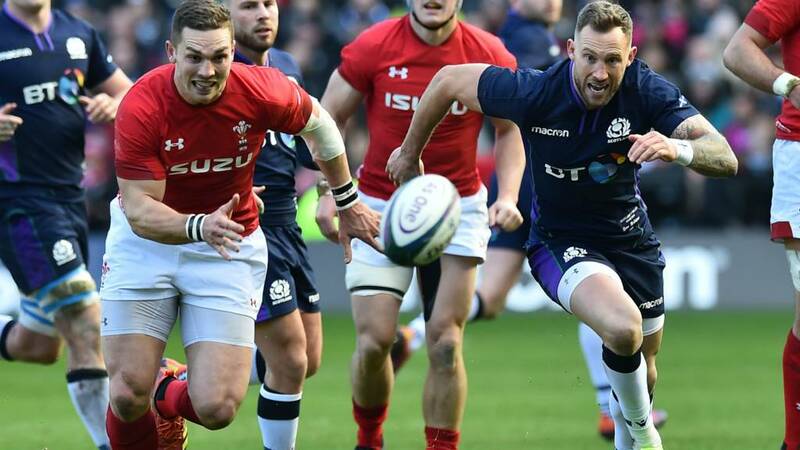 Wales march on after a bruising, enthralling encounter in Edinburgh. The Grand Slam is still very much alive. Beat Ireland next weekend, and it's theirs. Wales' record winning run stretches to 13. Warren Gatland is still unbeaten against Scotland - that's 11 wins out of 11 now. Alun Wyn Jones has now won more Wales Tests than anyone - he's up to 62.